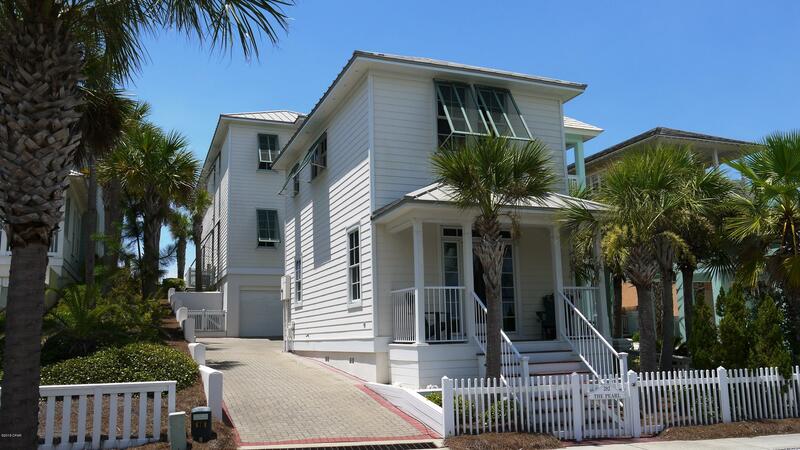 ''The Pearl'' is a Gulf front home with a main house and guest house, which is perfect for an active family, a rental property, or a permanent home. The home has just been totally redecorated and is ready to move in. It will fit your every need and afford you the luxury of a view of our spectacular white sand and aquamarine water. The main house has a ground level covered entry and garage; the second level has living (with fireplace), dining, kitchen, bedroom and bath; and the third level has a large master suite with fireplace, laundry room, guest bedroom and bath. All bedrooms have private covered porches with views. The guest house has 2 bedrooms, 2 baths, living, kitchen and laundry room. Home is being sold furnished with a small exclusion list.